According to the Centers for Medicare and Medicaid Services (CMS), hospital readmissions for Medicare patients cost US taxpayers more than $26 billion each year—more than $17 billion of which is avoidable. Moreover, the total amount of Medicare penalties assessed on hospitals for readmissions will increase to $528 million in 2017, nearly $110 million more than in 2016, according to the Kaiser Family Foundation, a nonprofit focused on national health issues and the US role in global health policy. To help reduce these monstrous costs, a better post-discharge system needs to be put in place. Research conducted by The Kaiser Family Foundation revealed that beneficiary readmission rates across the nation began to fall in 2012, and have continued to drop since then. This perhaps suggests that hospitals and clinicians have, in fact, adopted new, system-wide interventions and practices—following the CMS in conjunction with the Affordable Care Act launched the Hospital Readmission Reduction Program. As a healthcare solutions partner and document management expert, we believe a big part of discharge best practices is better communication—largely in the form of patient folders provided to patients before released from the hospital. Recognizing that the period immediately following discharge is a vulnerable time for patients, it is critical that caregivers, care facilities, home healthcare aids, and the patients themselves are educated properly through clear communication. This is achieved, without question, with the use of a patient folder. In this blog, we will cover four vital ways patient folders are a lifeline for patients as they recover, keeping them healthy and preventing their readmission to the hospital. 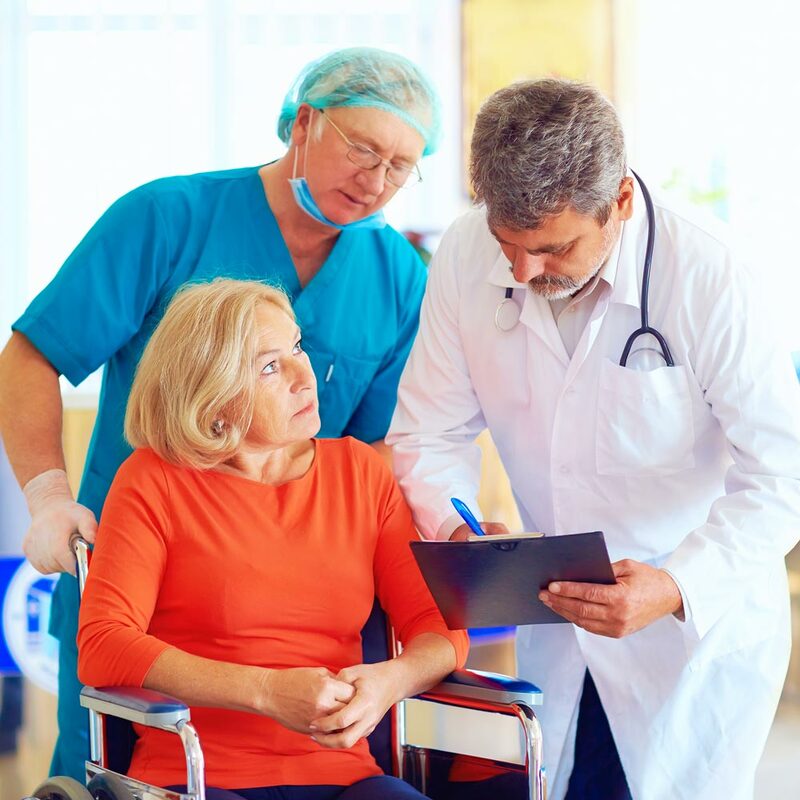 Medical studies suggest that patients who followed up with their physician within seven days of discharge were less likely to be readmitted to the hospital. CMS launched a two-year pilot program in 2008 where participating hospitals aimed to lower hospital readmissions by 2 percent within one month. The study showed that Valley Baptist Medical Centers in Brownsville, Texas, and Harlingen, Texas, exceeded the objective, achieving 2.8 percent and 4.2 percent reductions in readmissions, respectively, by working with physicians to ensure patients were being scheduled for follow-up visits within seven days. Patient folders contain this critical information, timelines, and helps recently discharged patients with scheduling the proper follow-ups that prevent readmission. Post-discharge and home healthcare are also powerful tools for preventing readmissions. A recent Avalere Health study showed that chronically ill patients receiving home healthcare services resulted in nearly 20,500 fewer readmissions than those receiving other post-acute services such as long-term acute-care hospital services. But, home healthcare (and outpatient rehab) are only as good as the care instructions they recieve. This is where a patient folder is vital in preventing readmissions. All necessary documentation, hospital history, medication management, and care instructions are housed in one secure, easy-to-use folder for quick references and accuracy checks. Patient education and instruction are critical components of readmission prevention. For example, a team of heart failure experts at UCSF Medical Center recently monitored cardiac patients after they were released. These experts target preventable readmissions by educating patients about their disease using the “Teach Back” method. This method requires the patient to repeat back the information they’ve learned to ensure a true understanding. The medical center’s approach reduced 30-day and 90-day readmissions by 30 percent. Patient folders are also helpful tools for discharged patients whether they are using the Teach Back method or not. In case they forget instructions for medication, dietary requirements or restrictions, or physical therapy, they can use their personalized folder as a quick, clear, easy reference. Further, this critical transition time requires crystal-clear communication among primary care physicians, long-term care facilities, home healthcare agencies, and anything in between. The National Transitions of Care Coalition encourages the use of a universal transfer tool to standardize transfers and transitions and mitigate readmissions. One such way of doing this is through a patient folder, which works as an equivalent tool that provides all patient information. With the implementation and use of a patient folder, nothing will be lost in translation. Language barriers and lack of understanding are major issues that negatively impact the probability of hospital readmissions. Healthcare experts across the board agree that patients with limited English proficiency have an increased risk of readmission. As such, The Joint Commission established new requirements for hospitals delivering care to these patients including proof of interpreter training and fluency competence for interpreters in spoken languages, as well as American Sign Language. What we have found additionally very helpful and supportive in reducing hospital readmissions is a patient folder. Patient folders target and assist these at-risk patients with documents translated into the patient’s native language so that there is never a miscommunication regarding follow-ups, medication management, or patient education. Another alternative is that breaks down language barriers is an in-house translation service. For instance, Hygrade’s translation service translates any vital patient forms and documents into 23 different languages. As you can see, communication is paramount to discharged patient care and hospital readmission prevention. Offering a translation feature ensures clear communication. Further, ensuring prompt follow-ups, implementing a robust home healthcare program, and providing in-depth instructions regarding medication, diet, and general care are of utmost importance. Patient folders help healthcare providers and their patients check off each of these essential boxes.